The animosity shown by the Hindus to the Muslim and their own experience of two-and-a-half year Congress rule strengthened the Muslims belief in their separate nationality. The discriminatory attitude coupled with attempts by the Hindu dominated Congress to suppress the Muslims impelled the Muslims to finally demand a separate sovereign state for the Muslims. 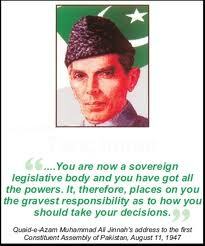 Has any thing changed, after almost 70 year, the prophetic words of Quaid-e-Azam? This is an interview by the Arab News back in 2006 with Dr Israr Ahmed – some very pertinent points are raised. Something we all have been discussing about people being responsible for their state of affairs not just the politicians. Dr. Israr Ahmad is known for his excellent analysis of the Qur’an in Urdu. He appears regularly on PTV, QTV and Peace TV providing critical explanations of the holy verses. He was originally associated with Maulana Abul Ala Maududi, the founding father of the Jamaat-e-Islami. He was even more closer to the legendary Maulana Ameen Ahsan Islahi, the author of the monumental analysis of the Qur’an entitled “Tadabbur Al-Qur’an.” Dr. Israr drew inspiration from his mentor, Maulana Islahi. Maulana Islahi was also associated with Maulana Maududi. When there were differences between Maulana Maududi and Maulana Islahi and many other leading scholars of the time on the issue of whether the Jamaat should dabble in politics, Maulana Islahi parted ways with Maulana Maududi. Dr. Israr followed his mentor and dissociated himself from the Jamaat and Maulana Maududi in the late 1950s. Maulana Islahi and Dr. Israr were of the opinion that reforming society should take precedence over politics. Maulana Islahi also edited the respected Islamic journal “Misaq,” which is still published from Lahore. In a special issue of the journal, Dr. Israr’s biography was published. Dr. Israr completed his graduate degree in medicine (MBBS) from Lahore’s King Edward Medical College in 1954. He gave up his medical practice in 1970 and since then has devoted his life for the study and teaching of the Holy Qur’an. Dr. Israr was in Jeddah last week and Arab News sat down with him for a discussion on the current state of affairs in Pakistan. Now in his 70s, Dr. Israr seemed very disillusioned and pessimistic. In his younger days he was very active in politics having been the president of the Jamiat-ul-Tulba, but it is politics that now disturbs him. 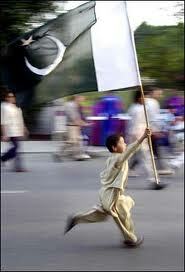 ON March 23, 1940, the Muslims of the sub-continent resolved to create a separate homeland, Pakistan. The decision was neither taken in haste nor precipitated by a sudden, dramatic turn of events. The background of Pakistan Resolution is such that in 1937, provincial autonomy was introduced in the sub-continent under the Government of India Act, 1935. The elections of 1937 provided the Congress with a majority in six provinces, where Congress governments were formed. This led to the political, social, economic and cultural suppression of the Muslims in the Congress ruled provinces. The Congress contemptuously rejected the Muslim League’s offer of forming coalition ministries. The Muslims were subjected not only to physical attacks but injustice and discriminatory treatment as regards civil liberties, economic measures and employment and educational opportunities. The Congress Ministries introduced the Wardha scheme of education, the object of which was to “de- Muslimize” the Muslim youth and children. However, the Muslim demand was violently opposed both by the British and the Hindus; and the Congress attitude toward the Muslims led to the hardening of the Muslims belief that only a separate homeland — Pakistan — can guarantee their freedom. This demand was put in black and white on March 23, 1940. He further said that by all cannons of international laws, we are a nation. In 1945, Quaid-e-Azam proclaimed that only Muslim League represented the Muslims, and proved it to the hilt during 1946 polls, winning 100 percent seats at the Centre, and 80 per cent in the provinces. Nothing could have been more conclusive to shatter the Congress claim of being a national body. If the British had read the writing on the wall in this verdict, Pakistan could have come into existence two years earlier without bloodshed. With his charismatic personality Quaid-e-Azam turned the dream of a separate homeland into reality on 14th of August 1947.